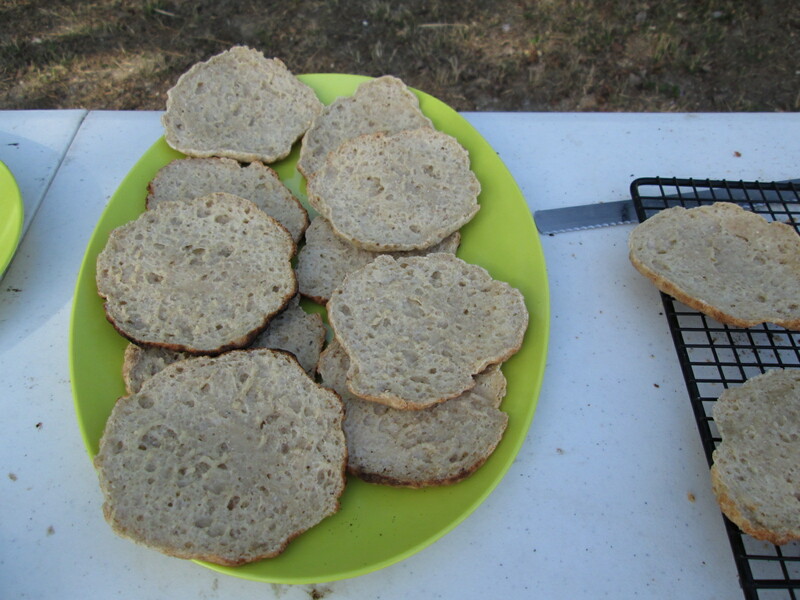 Round bread things — gluten-free! I was trying to make pita bread. Which, this really isn’t. Mainly in that it’s not as dry as pita bread (which is kind of weird, because you can usually count on gluten-free bread being drier than wheat bread), nor as puffy, and without the cavity in the middle. And they’re smaller — given the structural integrity issues that gluten-freeness can cause, I’d suggest staying on the smaller side. So basically these are nothing like pita bread. Sorry for the misdirection there. They are small sandwich round bread things which are tasty, allergen-free, and seem to please the few non-allergenic people I’ve fed them to (i.e. my neighbors). So you should try them! You’re going to make three mixes and then mix them all together. With me? Mix until you have a pretty solid dough, reasonably thick and pulling away from the sides of the bowl. The nice thing (“nice”) about gluten-free baking is that you really can’t overmix things. There’s no gluten to get tough. I let my mixer go and make up the dishwater while it’s working, so maybe 5 minutes or so. With well-oiled hands, scoop out 1/4 cup of dough and shape into a smooth ball. Press out to form the round — aiming for 1/8 — 1/4 inch or so in thickness, but all about the same (thickness is more important than exact size for cooking time). 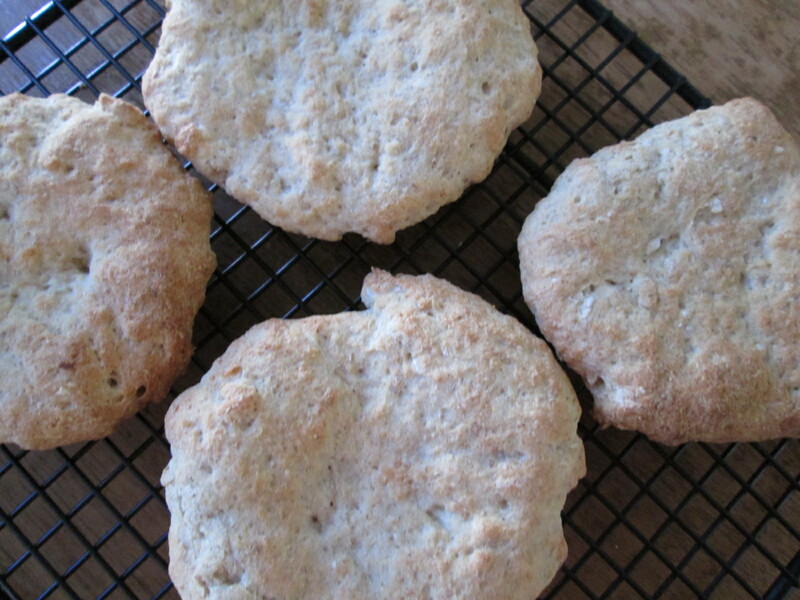 Place the round on a parchment covered baking sheet. Repeat until you’ve used all the dough. Place into a COLD OVEN and turn the oven on to 400F. The timing from here on out will depend on how fast your oven heats up — mine takes almost 20 minutes to reach 400F. Check these out at about 20 minutes, but it will likely take 35-45 minutes for them to fully bake, depending on the thickness of your rounds. Now the one thing that you’re missing are the toasted bubbled bits that a real pita bread has — if you want these, throw the pita on a grill or into a hot skillet, a few minutes on each side. This is not necessary, but does add flavor and visual texture. When the bread rounds are completely cooled, you will be able to slice them, but carefully! Don’t expect to make pita pockets, but honestly these hold up better than most gluten-free bread for sandwiches (or at least the ones that are also egg and dairy free), so give it a try.